This page only applies to Officials who registered in a state outside of the Southeastern District. If you completed your USA Hockey registration with an address in a Southeastern District State, you can ignore this page. Southeastern District states are listed under the States menu item above. The Southeastern District maintains a database of registered USA Hockey Officials with their background screening to ensure eligibility for working USA Hockey games in the Southeastern District. We receive registration data for all Officials registered in the Southeastern District. USA Hockey will only share your registration information with other districts other than your home district if you authorize USA Hockey to share the data. If you are planning on officiating in the Southeastern District, releasing your registration data will verify that your registration is complete and you are available for game assignments. In order to release your registration data to the Southeastern District, log on to your USA Hockey Profile page and select "My Profile". From your profile page, select "Officiating Information". 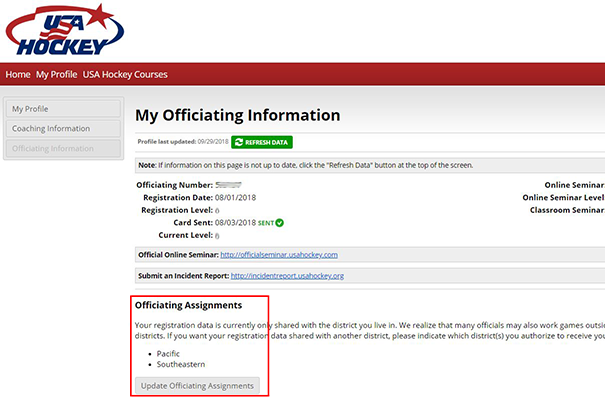 Scroll down to Officiating Assignments and click on the button to "Update Officiating Assignments". Select the Southeastern District from the dialog box. USA Hockey does not track background screening information, so in addition to releasing your registration data, you must also send your background screening information to the Southeastern District Screening Coordinator. If you are working in Florida, your background screening must be no more than one year old. Background screening is required every two years for all other Southeastern District states. You can read more about background screening on the Southeastern District Screening Page. Adding the Southeastern District to your Officiating Assignments will also allow you to create an account on the Southeastern District web site and give you access to the Official's Resource page. Your registration status will be shown with Out of District Officials. If you want your registration data to appear on a specific state Referee Roster, send an email to the Southeastern District Webmaster and let us know which Southeastern District state you will be working in so we can add you to the proper state roster. Questions? Email the Southeastern District Webmaster for assistance.